The other day I had an epiphany while I was perusing the aisles at Trader Joe’s. 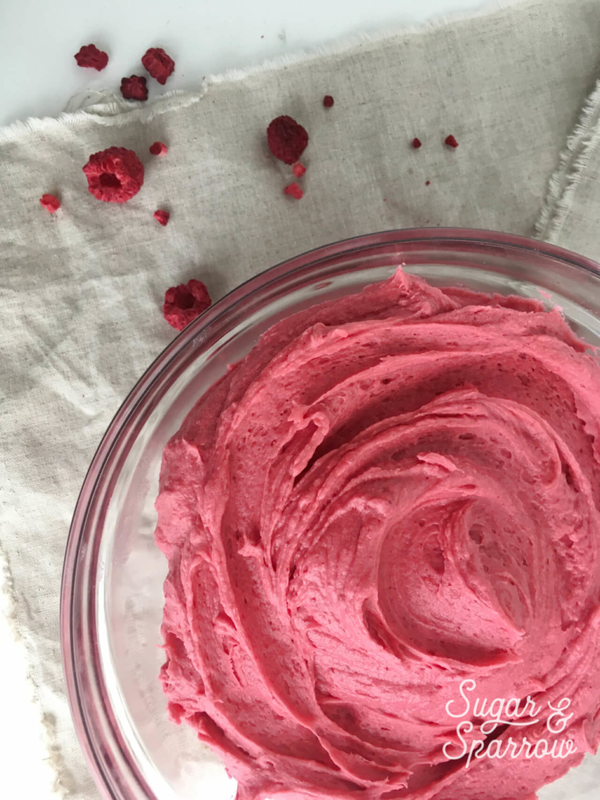 I stumbled upon their selection of freeze dried fruits and when I saw the raspberries I knew I had to try them in a buttercream recipe. The results? Absolutely flawless flavor, not too sweet (like when you use raspberry jam or preserves), not watery (like when you use fresh raspberries), and so easy to work with! The process of freeze drying simply removes the moisture from the raspberries while keeping them packed with flavor. 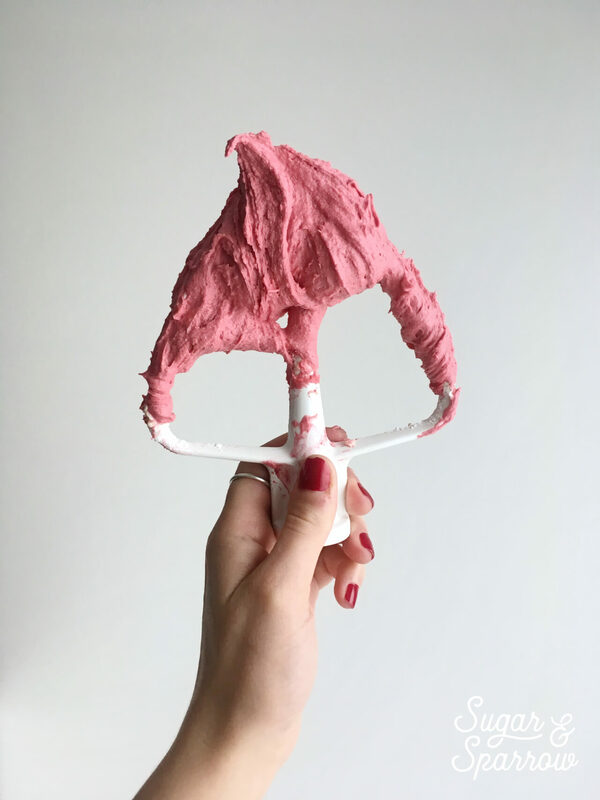 They’re perfect for baking in your favorite scone recipe, throwing into pancake batter, or in this case, grinding into a fine powder with a food processor and tossing into a buttercream recipe. And just look at the color! 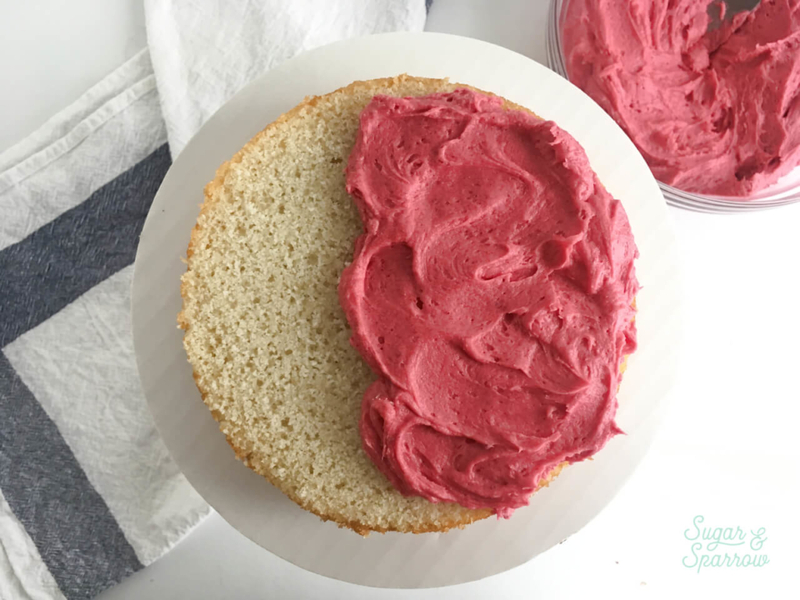 I’ve used this raspberry buttercream recipe to fill a matcha cake, top vanilla cupcakes, and have even gotten a bit crazy and mixed it with vanilla buttercream to make a flavor ombre as a cake finish. It’s a good pairing for pretty much any cake flavor you could think of! 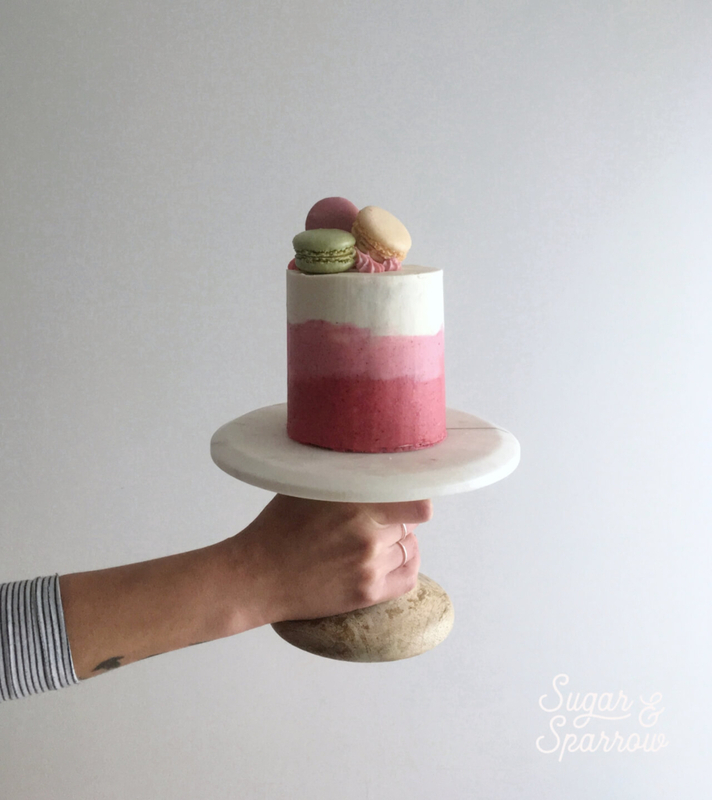 A light, balanced raspberry buttercream that's packed with flavor. The perfect addition to any cake! With a food processor, grind the raspberries into a fine powder. Sift out the seeds (if a few seeds end up in the powder that is totally ok) and set the powder aside. Whip the butter using a stand mixer with a paddle attachment on medium speed until it’s creamy and light in color (5-10 minutes). Add vanilla, milk, and raspberry powder and continue to mix on medium for 3 minutes. Add powdered sugar one cup at a time, scraping down the bowl and paddle after each addition. Add a pinch of salt (I like about an eighth of a teaspoon) and mix on low for another 30 seconds. This buttercream can be made ahead and stored in an airtight container in the refrigerator for up to two weeks. Just bring back to room temperature and re-whip with your mixer! As a filling for a matcha cake. It would also pair perfectly with a chocolate, vanilla, or lemon cake. Mixed part of it with vanilla buttercream and created a flavor ombre finish on a cake. The top is vanilla, the middle is vanilla-raspberry, and the bottom is raspberry. 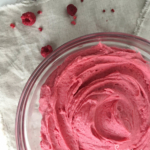 What will you do with your raspberry buttercream? Let me know in the comments or tag me on Instagram if you make this recipe! Really nice frosting, thanks for the recipe! I added 1/2 tsp lemon juice to help bring out the tartness. It tasted wonderful on lemon cupcakes! 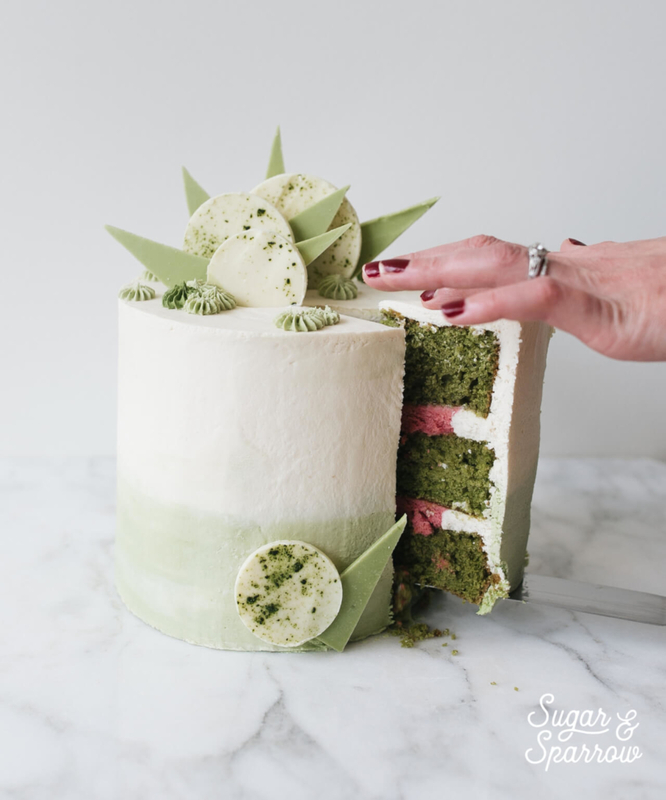 I also love the idea of pairing it with matcha like you did in your beautiful cake photo! Thanks so much, Sarah! I bet it tasted amazing with a little lemon juice added. I’ll definitely have to try that sometime!! How big was the cake you put it on? I want to make this (with the ombre style) for my nieces smash cake but I’d like to adjust the height a little. Thanks! Hi Nakita! This recipe makes enough to fill and frost a four inch cake (my four inch cakes are about 5 inches tall). Hope that helps! Thanks so much! Can’t wait to make this!